Cleopatra’s Choice slot machine will mesmerize you! Cleopatra’s Choice slot machine will definitely captivate all casino players, who try it from the very first time. There is no doubt because Egypt's ancient time always has been mysterious. There is something deep inside which makes many people think it's time to go and explore this wonderful world. Now you have the chance to meet and help the most beautiful queen, Cleopatra. Thanks to her, you will have the opportunity to enter her temple which is full of treasures. In fact, you will be able to choose which chamber you want to enter. Actually it doesn't matter which one you choose since all treasure chambers offer big wins for you! To experience this and become a part of the ancient Egyptian times, Cleopatra’s Choice slot machine can provide you 5 reels, 3 rows and 5 lines. 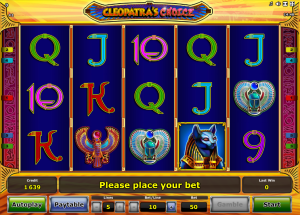 Cleopatra’s Choice slot has beautiful graphics and all of its symbols resemble the very old monuments and important emblems, such as the Anubis or the eye of Horus. The border of this slot machine is paved with gold-so is your journey to win! What do you need to do to get the highest winning? Well, the pattern is not a big deal: land 5 matching symbols on a win line. This might not be the easiest thing to achieve but if you are persistent and have a great online slot machine strategy, there is a big chance of winning with Cleopatra’s Choice slot. The important thing when playing online slot machines is choosing the right bet. This is the essential part of the game, this determines how much you can won. Cleopatra’s Choice slot machine has a Bonus feature, too. It's called the Pick and Win Bonus game. To enjoy this feature, you need to collect at least 3 Bonus symbols on a win line. Pick and Win feature will be activated on reels 3, 4 or 5. The symbol which you need is the pyramid. When the feature is active, you can see 5 doors which you can choose from. These doors hide high winnings! In fact, if you are still lucky, you can open a door which leads to another room, the Mystery Bonus room where you can pick a book in which you can find a mystery win! As usual, anytime you land a winning combination, you can gamble your current prize. There is a 'Gamble' button below the reels so if you would like to take a little risk, this option is for you. However, you can double or lose the winning so be careful! Note that it's not a compulsory thing, you can always collect your prize if you don't want to gamble by clicking on 'Collect' button. So, place the bet and the lines you want to play then press the 'Start' button to play. The Autoplay feature is also a great method if you would like to play in a more comfortable way. 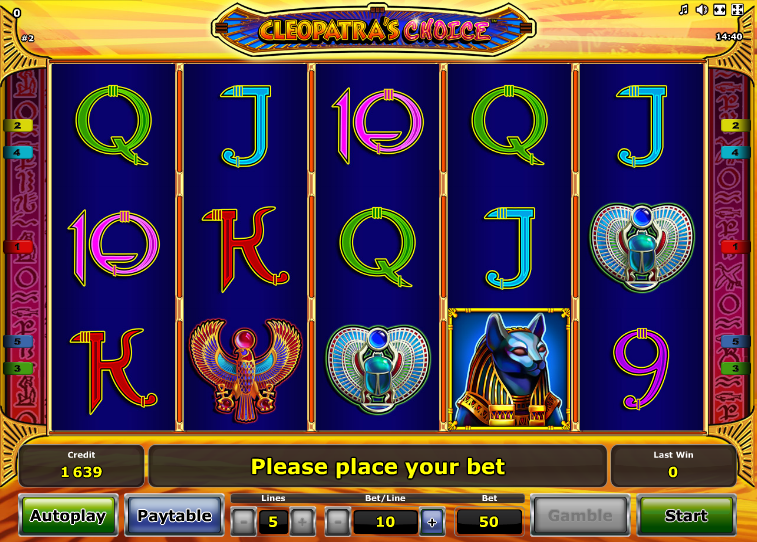 Cleopatra’s Choice slot machine offers a great way of entertainment for all casino players. Try it now and have fun!